Livingstone Rugby Club Zambia Trust (LRCZT) is a small Australian charity created in 2014 to set up a local rugby union club, the Livingstone Rhinos, providing a location (including grounds and clubhouse) and structure to develop grass roots rugby in the local area. LRCZT works alongside Tag Rugby Trust (UK) and The Happy Africa Foundation on the ground to not only develop junior rugby in schools and the community in Livingstone but to use the clubhouse for education including mid-week adult literacy and HIV education workshops and also a Girl Empowerment program. November 2018 see's Australian Wallaroo Rugby Champion Grace Hamilton follow in the footsteps of Wallabies George Gregan, Lote Tuqiri and Stephen Hoiles, supported by a group of junior rugby coaches to help develop "tag rugby" and community projects with primary schools in and around Livingstone Zambia, supporting the Tag Rugby Trust (TRT). 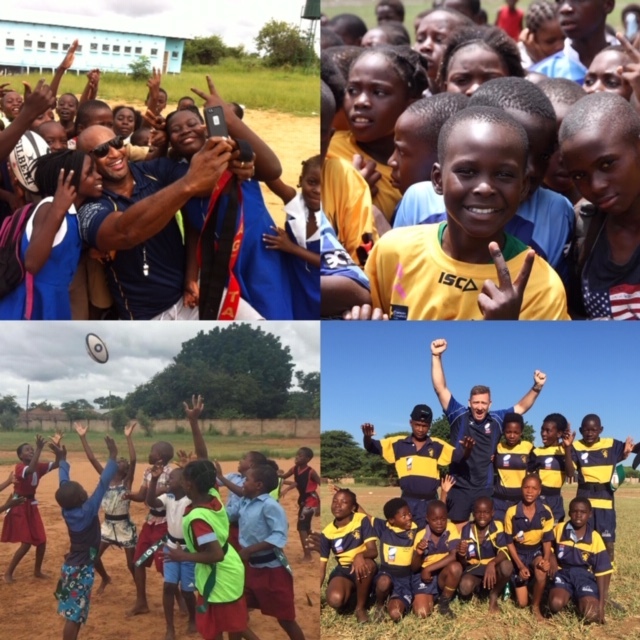 4 years ago a charity in Australia, Livingstone Rugby Club Zambia Trust (LRCZT), was set up and now run a community based rugby club by the name of the Livingstone Rhinos out of Bharats Sports Fields in Livingstone to engage with the local community not just around rugby but also through education in partnership with Happy Africa Foundation (HAF). In November this year, we will be returning to Zambia and will be again working in the schools coaching literally hundreds of amazing kids in this truly amazing but challenging location. The entire focus is enriching a community by ensure that we develop young kids and local teachers to develop skills that take them well beyond the play ground. Travel costs are covered but we are looking to raise additional dollars to support the on ground projects and equipment to support the Livingstone Rugby and overall operation of the community rugby club.Which when not hosting hundreds of kids in a safe playing environment also provides adult literacy classes, HIV clinics, Girls impact program supporting young women in difficult home situations along with the day to day maintenance of the ground & clubhouse, a vital water well and pump for the community, wages of a grounds keeper and a community officer and providing free meals to all the kids laying in organised community club tag rugby programs. Please support this great cause by making an online donation to LRCZT via this fundraising page. We know there are lots of very worthy causes to support but just a few dollars here makes a massive difference. Best of luck Lee! Great initiative. Well done Lee, and good luck to you, Paul and everyone involved. All the best to those involved. A great creative initiative. Good luck Lee! A great initiative and good fun too Enjoy your worthy work! Best of Luck with the trip Lee. Fantastic initiative! Such a great initiative and a nice cause to follow! Good luck Lee on your mission! Enjoy! There is a magic to the call of Africa! Great Welsh front row advice in the offering! Such a great initiative! Bestest of luck! Don t drop the ball! Good luck, enjoy the trip!